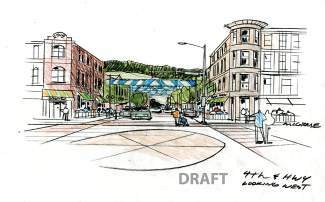 This rendering of 4th Street in Silverthorne is one of several residents will have the opportunity to comment about during the town of Silverthorne's final comprehensive plan community meeting. The public workshop takes place from 5 to 7 p.m. Monday, March 31 at the Silverthorne Pavilion, 400 Blue River Parkway. The town of Silverthorne reported more than 100 people attended the Monday, March 3 public open house about its comprehensive plan update and received loads of participation during subsequent community meetings earlier this month. Town officials are hoping the community’s interest continues to build momentum as they prepare to host their final community input event during a public workshop from 5 to 7 p.m. Monday, March 31 at the Silverthorne Pavilion, 400 Blue River Parkway. During the workshop, residents will have the opportunity to provide feedback on detailed sketches that have been prepared for various parts of the town. Following a presentation, residents will break up into small groups to evaluate opportunities to enhance Silverthorne’s commercial areas, including downtown retail, gateway features, walkability and connections, and urban design. During the first public open house, town staff and Frisco-based SE Group consultants spoke individually with visitors about their observations and goals for Silverthorne. SE Group was hired by the town of Silverthorne to facilitate the public input process. In addition to background boards, there were several hands-on activities community members participated in, including a visual preference exercise. Following the open house, Silverthorne officials hosted four additional community planning chats at Red Buffalo Coffee, the Silverthorne Recreation Center and Our Lady of Peace Catholic Church where residents were able to provide more input about the future look and feel of town. More information about Silverthorne’s Comprehensive Plan Update process can be found online at http://www.silverthorne.org. Residents unable to attend Monday’s final meeting can engage in the conversation by visiting http://www.engagesilverthorne.com.